With less than two months to election day, Hillary Clinton&apos;s health is now front and center in the presidential campaign. Clinton&apos;s announcement that she has pneumonia and overheated at a 9/11 remembrance event has drawn calls for both presidential candidates to be more upfront about their medical histories. Neither Clinton nor Donald Trump have released detailed accounts of their health. With Clinton, 68, and Trump, 70, running as the two of the oldest first-time candidates in presidential history, this obsession with the health of a potential President may seem new. But in the past, the health of candidates has been called into question, often through circulation of photos or videos by the media. And in some cases, a candidate&apos;s health has impacted their ability to sell themselves to voters. A little more than 56 years ago, then-Vice President Richard Nixon slammed his knee on a car door. With about two months to go until the election, Nixon was forced to spend the first half of September recovering and away from the 1960 presidential campaign. His knee became infected. "To be out of the game for two weeks was Nixon&apos;s worst nightmare," Roger Stone wrote in his 2014 book Nixon&apos;s Secrets. Nixon&apos;s overexertion following his knee surgery led to him looking thinner and ill during the first televised presidential debates. John F. Kennedy was widely seen as having won them. But an often overlooked reason for Nixon&apos;s poor debate performance was the substantial pain he was in. Nixon appeared less spry than Kennedy, even though the Republican was only four years older. A poor debate performance and the injury&apos;s impact on keeping an aggressive campaign schedule were key to Nixon&apos;s narrow loss to Kennedy. 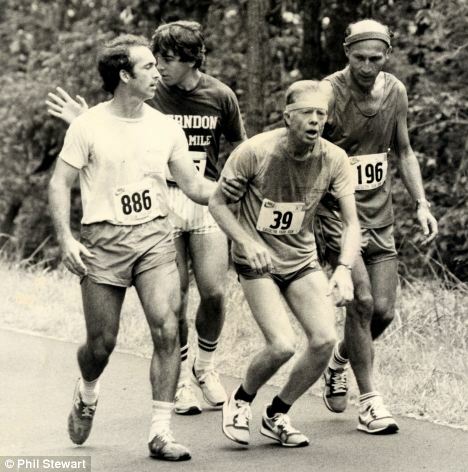 In late September 1979, President Carter went for a run on Catoctin Mountain in northern Maryland. Carter was known for his physical fitness, running 40 to 50 miles a week. But a photo of Carter nearly collapsing a little more than a year before election day did him no favors. Carter&apos;s doctor said he suffered heat exhaustion while jogging, though the President&apos;s staff initially worried the 54-year-old had a heart attack. On October 1st, Carter&apos;s 55th birthday, Time Magazine said Carter appeared "ashen-faced" and "the incident raised questions about the President&apos;s exercise program and general wellbeing." People wrote that Carter&apos;s collapse triggered "a moment of fear" at the White House. While the New York Times said Carter was "pronounced fit" after his near-collapse, the article detailed how Carter&apos;s doctor treated him extensively for what amounted to dehydration and heat exhaustion. Carter would go on to lose his reelection to Ronald Reagan after defeating Sen. Ted Kennedy in the Democratic primaries and attempting to resolve the Iran hostage crisis. With a challenged medical history including skin cancer, Senator John McCain faced pressure from the media to release records that would prove he was healthy enough to be President. As many as a third of voters in 2008 thought the then 72-year-old Republican presidential nominee was too old to be President. McCain&apos;s campaign ultimately allowed reporters to review more than 1,100 pages of his medical records. They were heavily detailed in the media and, while they detailed an older American with medical challenges, McCain was given points for transparency. The Arizona senator&apos;s longtime doctor said he found no reason McCain could not serve as President.